A Jewish aide reportedly wrote US President Donald Trump’s statement on International Holocaust Remembrance Day which was widely condemned for failing to mention Jews or anti-Semitism. 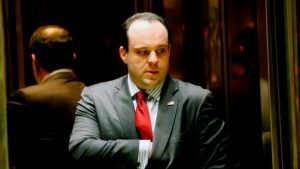 Boris Epshteyn, a special assistant to the president, wrote the speech, a source told Politico on Monday. In the speech Trump vowed to combat the forces of evil, and called on listeners to “make love and tolerance prevalent throughout the world,” but failed to mention Jews or anti-Semitism. The omission was condemned by Jewish organizations across the spectrum, including the Anti-Defamation League (ADL), the Republican Jewish Coalition (RJC), and the Zionist Organization of America (ZOA). Democratic Virginia Senator Tim Kaine called it Holocaust denial. Formerly a New York-based investment banker and finance attorney, Epshteyn worked as a communications aide for Sen. John McCain’s presidential campaign in 2008, focusing his efforts on the Arizona senator’s running mate, then-Alaska governor Sarah Palin. Epshteyn has been criticized for his business ties with Russia and for claiming on CNN that Russia did not seize Crimea. Help HAJRTP & the American Gathering with every purchase you make on Amazon just by following this link.